I hear this line from Patrick Cornacchiulo, CEO of Pervine Foods, maker of FitCrunch bars and powders, as a polite understatement. To date, most of the sports nutrition industry’s forays into salty snacks have been abysmal. I should know. While working at a fitness magazine a few years ago, I remember the much-ballyhooed debut of the Quest protein chips. Quest carpet-bombed our office with crates of these things and I remember thinking, “They look like Baked Lays! How bad could they be?” The answer: worse than I could have possibly imagined. After an initial burst of flavor powder on the tongue, during which the brain says, “Eh, not bad!” the chip turned to bitter ash in the mouth. Piles of these chips wound up on the editors’ “free table” where we dumped all the PR giveaways we didn’t want. A DVD of an upcoming un-aired episode of Big Brother might find an audience in a few hours. A hard cover copy of Jesse Ventura’s political musings, DemoCRIPS and ReBLOODlicans might kick around for a few days before someone would finally take it as a joke. The Quest chips stayed. And stayed. Until the janitor finally got the hint after a month and dumped them. So, no, I wasn’t very excited when Cornacchiulo showed up to a recent Team Irvine meeting with the new protein puffs and started passing them around the table. I started having Quest chip flashbacks and they weren’t pleasant. He took one container of each flavor—sour cream and onion, barbecue, and cheddar cheese—and placed them at the end of the table and asked people to taste them and pass them down. Then a funny thing happened. The surprised, even delighted looks on people’s faces said they were good. Then came the cooing and the “mmm”-ing and more crunching. You could dismiss all of it as people being polite, but the samples weren’t moving. They stayed clustered at one end of the table until Cornacchiulo had to remind people to keep passing the containers. “Don’t be greedy. Just quick puff, puff pass,” which is something he did not say, but totally should have. Most people will take a bite or two to be polite. Sure. Third and fourth helpings to be polite? Not so much. When I finally got my hands on a sample I had to concur. The initial burst of flavor was really good. Then I waited for the bitter aftertaste, for the sad realization that I wasn’t eating a Planter’s Cheez Ball but something healthy. It never came. The FitCrunch High Protein Puffs tasted like an honest-to-goodness snack. That rare healthy food item that can stand toe-to-toe with its unhealthy competition and win based on the merits of taste and not just the nutrition label. I wanted to learn more, so I contacted Elena Fusaro, FitCrunch’s Brand Manager, and Dave Plowden, the company’s Marketing Director. Fusaro and Plowden were the ones on the ground in the factory, grabbing handfuls of the little flavor-dusted protein puffs as they came down the conveyor belt, intermittently tasting each batch to make sure the flavor was consistent with what had originally been put together in the lab. “We went through quite a few prototypes to get to where we are today,” Fusaro says, explaining that the whole process from concept to launch at the 2018 Olympia Expo in Las Vegas took about a year. So how were they able to pull it off? To make the savory snack that has eluded every company in the massive supplement industry to this point? Plowden had one word: Robert. Robert’s main sticking point: consistent big, bold flavor on every puff, without adding an amount of salt or fat that would kill the product as a health item. In the end, the FitCrunch team didn’t just deliver in terms of taste, but on macros that are hard to believe: each 30-gram bag contains 20 grams of protein, 4 grams of fat, and just 2 grams of carbs at 130 calories. The Puffs aren’t just an enticing replacement for potato chips; 65% of the serving is protein, making them a quality supplement for fitness enthusiasts. The puffs also compare very favorably to other protein-infused snacks, like Lenny & Larry’s Complete Cookie, which packs a hefty 400 calories, 66 grams of carbs (including 24 grams of sugar), and 16 grams of fat to go with 24 grams of protein. More surprisingly, however, the great nutrition label on the Puffs was achieved with a relatively simple ingredient list—starting with milk protein isolate—and no sugar alcohols. The Puffs also join a fast-growing non-GMO segment of the snacking industry while containing no soy, gluten, artificial colors, or artificial sweeteners. “I’m really excited for this launch,” Robert says. “I honestly can’t think of anything out there that’s quite like this. And look: no one has to take my word for it. Try a bag. You’re not going to call me a liar; you’re going to want more. FitCrunch puffs officially launched at the Mr. Olympia Expo, and are now available at local gyms and Costco. 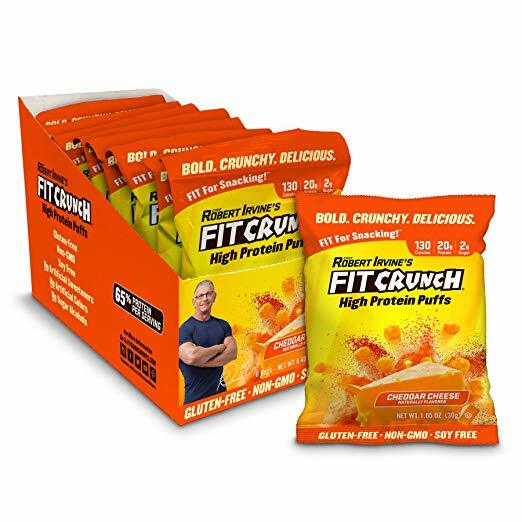 You can order the full line of FitCrunch products at The FitCrunch WEBSITE and AMAZON.